hi sweetie! Hope you have a great day! Pippy my moms from Michigan. We are now in the cold state of Maine. It looks like you know the best way to take a nap: with a cuddly friend. Have a Wonderful Wednesday! That’s funny because my mom wants to move to Maine! She things it’s just beautiful!! You look very comfy Pippy 🙂 Have a wonderful Wednesday! Peppino, Your ears may well rival the big ones my Cardigan Corgis have! I’ll have to post a good ear-shot, mine are pretty big!! 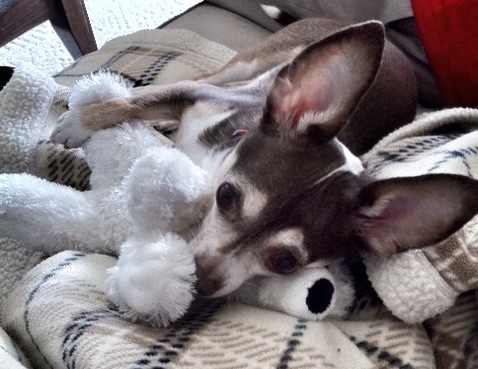 Awwwww…Gotta have your stuffies!!!! CUTE!!!! Awwww, Peppino. You look so cute snuggling with your little stuffie. Thank you! He was very comfy! Thanks!! It’s nice to meet you too! Awww, you getting some cuddles!? We love your ears. Awww…who is your stuffie friend? Isn’t he cute? Mom & Dad brought him back for me when they were at the Toronto Zoo last year. You sure look happy with your stuffie! I am, he makes a good head rest! Thank you!! You are too sweet! !